Crews are at work building the planted concrete islands that will separate the Fell and Oak bike lanes from motor traffic. As we reported earlier this month, the long-delayed project is now supposed to wrap by April. The new construction is a sign that city agencies may make good on that. This week crews carved up the asphalt at several spots along the Oak Street bike lane’s buffer zone, from Baker to Scott Streets, to prepare for the installation of the islands. The construction barriers provide a preview of the better sense of protection along the bike lane once the islands are complete. According to Department of Public Works spokesperson Dadisi Najib, DPW and the SF Public Utilities Commission expect to finish the islands on Oak by March 20, and work on Fell will be completed between March 2 and April 30. The protective bike lane islands are the final component of the safety measures going in on Fell and Oak. Pedestrian bulb-outs with rain gardens have been under construction for months. Hopefully, the islands will also finally send the message to drivers to stop parking in the bike lanes, and the ranks of daily bike commuters who use them will swell from the current level of roughly 1,800. Remove residual parking spot just for bike lanes. I’m confused. Why are they moving the bike lane to the right side of a one-way street? 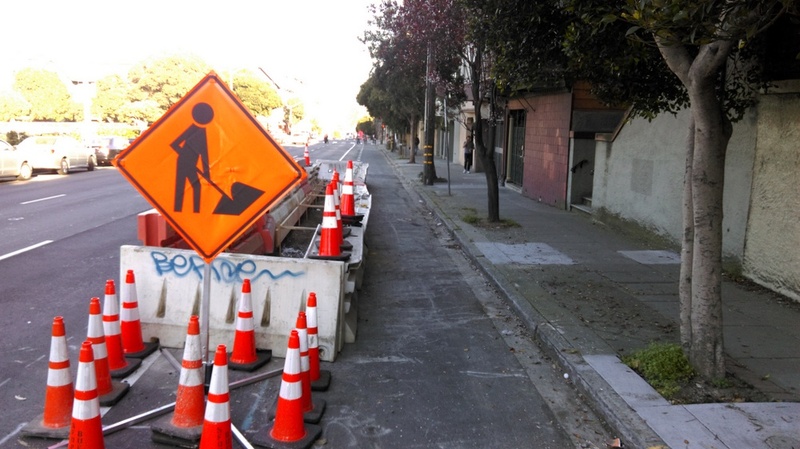 Now will bike riders coming from the Wiggle to GG park have to cross Fell Street 3 times? Protected bike lanes on one-way streets belong on the left hand side of the street, because it’s a lot harder for drivers to left-hook a cyclist from left-side bike lane than it is for a driver right rook a cyclist from a right side bike lane. NYC has already proven this and that’s why they already use left side protected bike lanes on their one-way streets. I really hope this new design isn’t that boneheaded! This is impressive. Are one side of both Fell and Oak already without street parking? What will be the total extent of partitioned bike lanes when this construction is complete? Nothing is moving. 🙂 The bikeway will continue to be on the south/left side of Fell St and the south/right side of Oak St. I think what you’re noticing are the rain gardens and sidewalk extensions which are being installed on the north side of Fell St.
Next step: make the southbound portion of Scott from Oak to Page bikes only (no vehicles) and replace the huge slick manhole cover right where the turn from Oak to Scott is with some surface that is a little less dangerous. 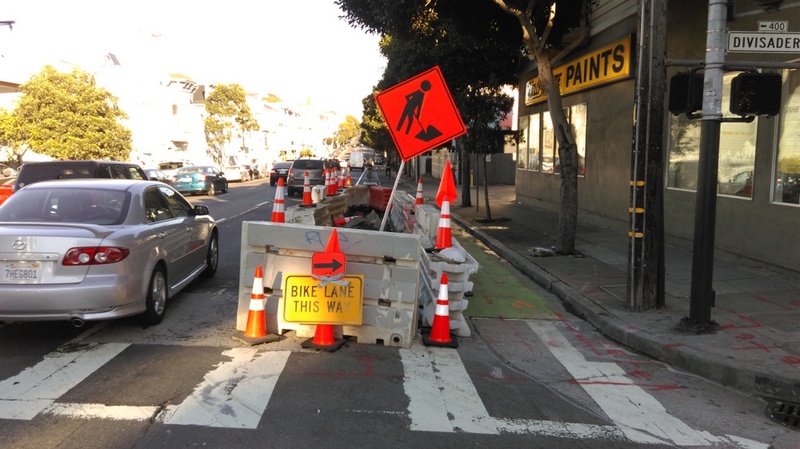 I will point out that although this is significant progress, it still falls far short of 8 to 80 infrastructure (especially because of the mixing zones at Divisadero), and the vast majority of my contemporaries (women over 50) would still refuse to ride it. The “bike lane” portion of this is essentially unusable. While they have directions for bikes to go down where the bike lane is, it’s almost always blocked by construction vehicles/workers/debris. It’s easier just to take the center lane of traffic. I took take this route daily. I don’t see this as a problem they will address until they finish. I thought he said that about Valencia St back in the late 90s.